The city of St. Charles is celebrating its 250th anniversary and Meriwether Lewis and William Clark are front and center. In 1804, Lewis and Clark took part in the first American expedition to cross the western portion of the United States along with Sacajawea, a Native American woman who helped (along with others) the Lewis and Clark Expedition in achieving their chartered mission objectives. St. Charles served as the final embarkation point of the Lewis and Clark Expedition. At noon on May 14, 1804, Clark and approximately 42 men docked at St. Charles, the first permanent European settlement on the Missouri River and one of the first in the state of Missouri. While awaiting Lewis’s arrival the men entertained the townspeople on the boats, danced at balls and attended a Mass conducted by a local priest. After reaching the Pacific Ocean, Lewis and Clark retraced their journey and returned safely to the St. Charles riverfront on Sept. 26, 1806. The St. Charles Historic District includes numerous 19th-century residential and commercial buildings, and is the home of the first Missouri State Capitol building (1821-1826). Inside the lobby of St. Charles City Hall, located at 200 North Second Street, are two awe-inspiring works of art inspired by the two adventurers and their famous guide. 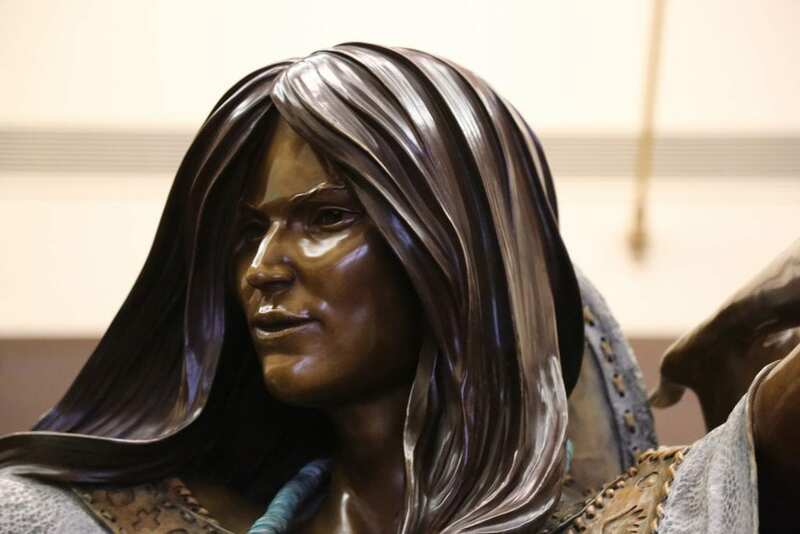 Titled “Birdwoman”, the eight-foot patinaed bronze statue was given on loan to the city by Harlan Pals and family and it will be on display throughout 2019. Also in the lobby of city hall, St. Charles Mayor Sally Faith commissioned Gary Lucy to complete the painting depicting the important moment in history when “La Vigilante” made its way from New Orleans. Lucy feels the creation of this work will serve as a valid, educational interpretation of the late 18th century inland waterways heritage. One of the first pieces of research Lucy used to begin this project was a drawing done by Clark of the original design of La Vigilante. Clark’s drawing, produced in New Orleans, is the only known drawing of the Spanish Galley. Also throughout 2019, beginning in March, you will begin to see statues of Lewis and Clark’s famous dog, Seaman, all around town. These three-foot depictions of the famous Newfoundland will be on display at various locations for everyone to visit and take their photo by. Each statue of Seaman will be painted and decorated individually by the specific business in which he will be parked out in front of. If you aren’t familiar with Seaman, he was thought to have been purchased by Lewis for $20 while he was in Pittsburgh waiting for the completion of the boats that would be taken on their journey. There is no record as to why Lewis selected a Newfoundland – whether it was simply a dog that caught his attention or whether he selected Seaman because the breed is known for being smart and strong with good swimming ability. Stay tuned to www.stcharlescitymo.gov for details on where you can find the statues. While you are out and about visiting Seaman, be sure to join in on the “Flat Lewis and Clark” adventure. Visit www.stcharlescitymo.gov and cut out and color your very own “Flat Lewis and Clark” and take them along on your adventures in 2019. Be sure to snap photos with Seaman and Flat Lewis and Clark along the way and share them on social media with #STC250. To culminate the birthday will be the Sestercentennial Celebration: An Adventure 250 Years in the Making on May 18 and 19. The celebration will kick off with a parade. 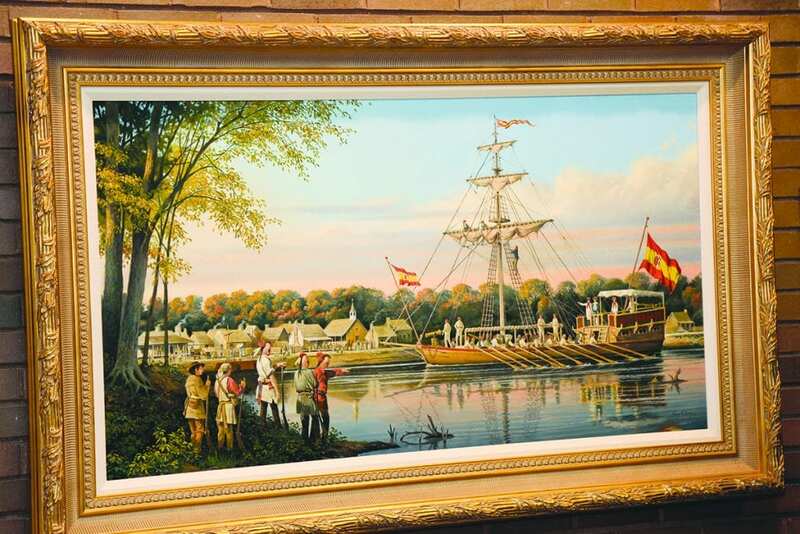 The procession will be a living, breathing timeline featuring 25 different entries, each representing a decade of St. Charles history. Then, throughout the entire weekend, Main Street Saint Charles will feature a variety of activities and displays celebrating the city’s rich heritage. Stay tuned to the Community News for more information as the date draws closer.